I think that rituals, if richly textured, can add a rhythm and a marker to your life. I have this coffee-making ritual I’ve had for 25 years. And I’ve evolved it as I’ve learned more about coffee. And the thing I love about it is, if you have a ritual of going to work out in the afternoon, oft-times something can come up and get in the way. But nothing ever gets in the way of something that happens at 5:30 in the morning. So I know that no matter what’s going to happen the rest of the day, I can do something really nice for myself and make something just for me. Something I love about the coffee ritual is thinking ‘What went in?’—the farmers, the pickers, the shippers, the roasters—everything that goes into that cup of coffee. I have a German gram scale where I weigh out the grams of coffee, and then I have a nice grinder where I grind the beans right before I make it. I’ve gone through periods where I use a French press, but currently, I like a pour-over drip. I’ve got a really beautiful Japanese kettle that has a long spout where you can aim the water to saturate the grounds. You can sort of agitate the grounds because the spout is so precise. If Lex were here in town (he lives in Durham), I think he might join me in appreciating the current crop of coffee we’ve got in from Zambia right now. I’m loving it. We found this lot from Kasama Estate to be rich, full-bodied, and complex, and loved its earthy, herbal, and bittersweet cocoa notes. Zambia used to be known in the US, for the history buffs amongst you, by its colonial name of Rhodesia. Named now more appropriately for the Zambezi river that runs through it. Coffee came later to Africa than it did to most—in the 1950s. 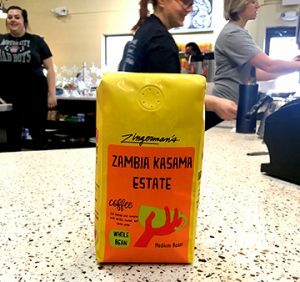 Kasama estate is in the northeast section of the country, about 400 or so miles to the west of the Mababu co-op with which our very good friend Shawn Askinosie works to get the great cacao beans for his terrific Tanzania chocolate.